With people putting more pressure on themselves to become healthier, it’s about time to give your pets the same fantastic treatment. 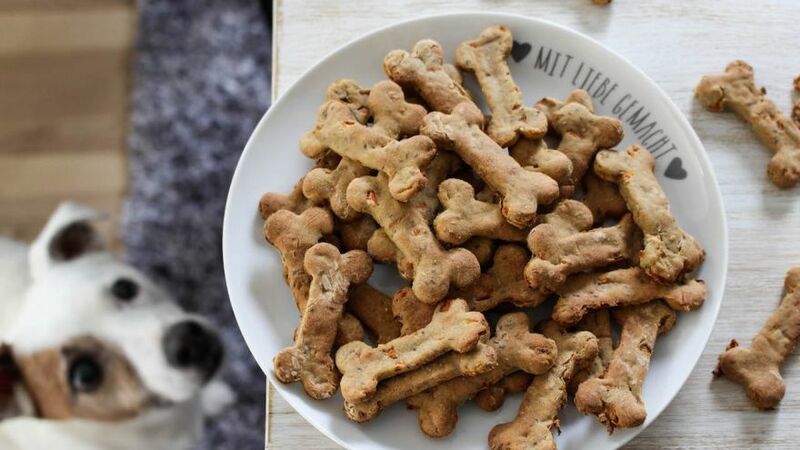 Instead of relying on traditional dog treats filled with fillers and preservatives, why not opt for something a little healthier? As healthier dog treats become more popular, they are also becoming more affordable. In today’s day and age, opting for healthy treats doesn’t necessarily mean tripling your dog food budget for the month. Below are our 10 favorite treats for your pups that are incredibly affordable and equally as healthy. 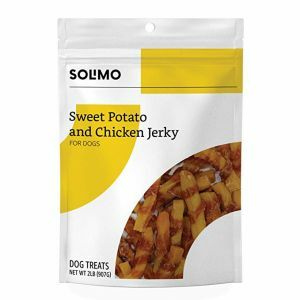 Available in chicken, sweet potato, and duck, the Solimo treats sound yummy enough for a human to enjoy them. When you take a look at the ingredient label, you’ll notice that the first two ingredients are the meat that you choose and sweet potato. As ingredients are listed in terms of the amounts found in the formula, this is comforting to know. The Solimo Jerky Dog Treats also don’t contain any soy, gluten, wheat, or corn, which makes them easy to digest for dogs of any size. With your order, you’ll receive a 2-pound bag of treats. They also come with a fantastic warranty. If you find that your pet isn’t completely satisfied with the treats, you can receive a full refund without having to return the treats. All of the ingredients used to create these treats are sourced from the United States. All of the chicken is grown in the U.S. and the treats are developed in small batches to ensure the purest quality possible. Each ingredient is 100% all-natural as well. For example, the chicken treats include chicken only. It’s also important to note that the meats do not contain any traces of steroids, growth hormones, or harmful ingredients. With the ability to not have to worry about preservatives, additives, artificial colors, or artificial flavors, your pups will love these 100% all-natural treats. Available in packs up to 250 rings, the Pawstruck Bully Stick Rings are a fantastic treat that your pet will love. They are made entirely from cattle that were raised without chemicals, were free range, and grass fed. The best part is that the bully sticks are entirely natural and have low odors, which is ideal for dogs with relatively stinky breath. 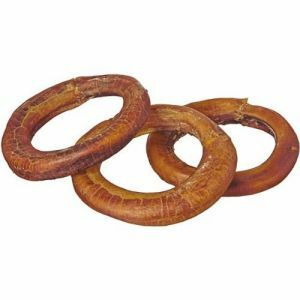 As a natural dog chew treat, the rings help to remove plaque and tartar for healthier teeth and gums. Each product is made in South American facilities and has been approved by the USDA and FDA. As another treat made entirely from natural animals, the Brutus & Barnaby slivers will be delicious for your pet. They are also easily digestible for animals who have been dealing with digestive issues. Depending on your budget, you can choose between a 1 or 2-pound bag of treats. 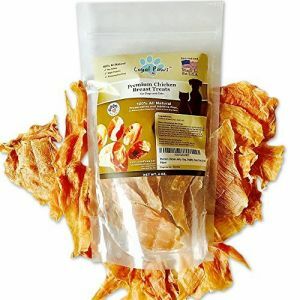 Every single pig ear sliver is 100% natural without any traces of synthetic chemicals. 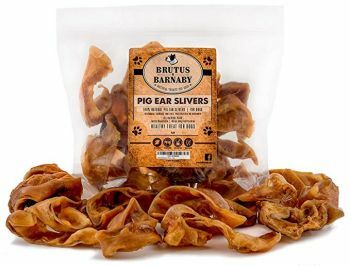 They are pure pig ears kept in a Ziploc bag for optimal freshness. There also isn’t any bone in the treats, so you don’t have to worry about splintering or crumbling, no matter how often your dog chews on the ears. 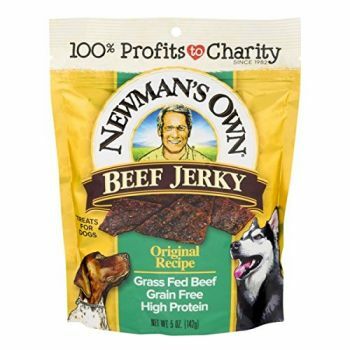 There are several different things that you’ll appreciate about the Newman’s Own Beef Jerky. The first thing that we noticed is that 100% of the profits from the treats are donated to charity, which makes them an even better investment for your pets. The beef used to make the jerky is completely grass-fed and whole muscle. It’s also 100% grain free, wheat free, soy free, and corn free. Not to mention there aren’t any signs of artificial colors, flavors, or preservatives. Additionally, you won’t have to worry about feeding your dog nitrites or nitrates. There are two different recipes to choose from: regular beef and beef with sweet potato. Triumph is a relatively well-known dog treat brand and it’s one of the most popular pet treat options for pet parents on this list. Not only is it incredibly affordable, but it’s also an incredibly healthy way to show your pet appreciation. In fact, the treats are so healthy that they are a fantastic choice for everyday training. 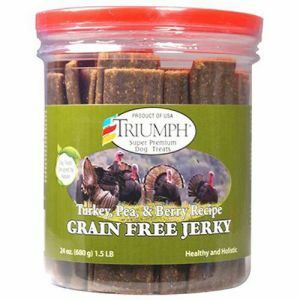 The Triumph Jerky is formulated using turkey, pea, and berry. It’s the perfect combination of sweet and savory that will have your dog begging for more. As a formula that is entirely grain-free, it’s also ideal for dogs who have shown signs of digestive discomfort in the past. Even though its name suggests that it’s gourmet, these treats are still affordable. 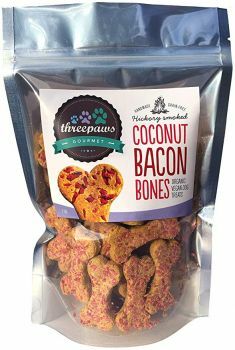 Filled with high-quality and luxurious ingredients, you’ll even be tempted to eat the Threepaws Gourmet bacon bones. The formula is completely grain free and gluten free, not to mention that it’s also a 100% vegan formula. It’s also important to note that it’s soy and corn free as well. Each treat is hickory smoked for a robust flavor that your dogs will love. The ingredients include whole ingredients such as organic coconut milk, organic coconut flour, organic garbanzo flour, organic peanut butter, and more. 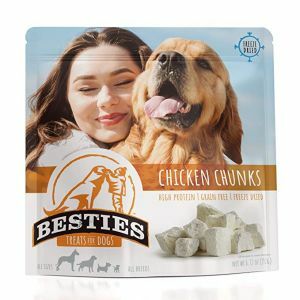 As a unique approach to the everyday dog treat, the Besties dried treats are fantastic for dogs of all ages. In fact, they are designed to be human-grade, which means that it’s surely safe for your pets to consume. There are only up to 2 ingredients in each treat. The meat has been microbe tested and does not feature any preservatives or additives. Each treat is also fully cooked to prevent illnesses, is impressively high in protein, and freeze-dried to lock in as many nutrients as possible. 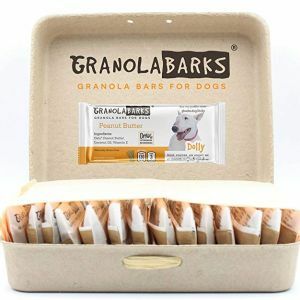 We love the Granola Barks for dogs because they are available in many flavors. You can choose from bison, peanut butter, chicken, salmon, veggie, and even a combination of all flavors. You can also choose between buying 28 individual parts or 50 bite-size pieces which are perfect for training. There are only 3 ingredients in the recipe: broth, coconut oil, and gluten-free oats. There’s only 65 calories per full bar and 1 gram of sugar, which makes them the perfect treat for the healthiest dogs. Additionally, every part of the packaging is fully recyclable. We also love how each wrapper has information about adoptable pets, including a link to the online profile for the pet that needs to be adopted. The Baxter Boy treats are designed to be as minimally processed as possible. They don’t have any additives, coloring, or artificial ingredients, which gives you the peace of mind you need. They are also naturally full of protein, low in fat, and feature one ingredient. Each of the cow ears are from free range and grass fed cattle that were raised without antibiotics or hormones. In terms of natural health benefits, these treats give your pets healthier levels of vitamin B12, iron, zinc, copper, and potassium. They are also packed with chondroitin, which assists with pet joint health. There are plenty of treats on the market to choose from when it comes to healthy yet affordable treats. With the help of these 10 items, you’ll be able to reward your dog in a healthier manner.